Michael Brendan Dougherty, at National Review, had the perfect response. Who exactly do you think has stymied the U.S. in Afghanistan for 16 years? The Taliban is made up of Afghan Bubbas. The Taliban doesn’t need to defeat nuclear weapons, though they are humiliating a nuclear power for the second time in history. They use a mix of Kalashnikovs and WWII-era bolt-action rifles. Determined insurgencies are really difficult to fight, even if they are only armed with Enfield rifles and you can target them with a TOW missiles system that can spot a cat in the dark from two miles away. In Iraq, expensive tanks were destroyed with simple improvised explosives. 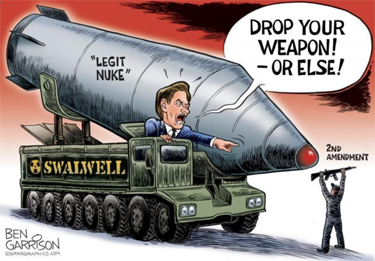 If the U.S. government (and the American people behind them) doesn’t want to use nuclear weapons on foreign fundamentalists in Afghanistan, why does anyone presume they’d use them against Americans in Idaho? It is not just our fecklessness. All great powers take into account the moral and manpower costs of implementing their rules and laws on a people. And an armed citizenry, especially if they seem to have a just cause to rally around, will dramatically raise the price of ruling them. The British Empire controlled one quarter of the world’s territory and ruled one quarter of the earth’s population in 1922. In that very year, they were forced to make an effective exit from the main part of their oldest colony, Ireland. Why? Because a determined group of Irish men with guns made the country ungovernable. The British technically could have deployed their entire navy, blockading the restive island, and starving any rebellion into submission. But they were unwilling to pay the moral price, or the price in blood. It was precisely this foreseeable event that had caused the British to ban Irish Catholics from possessing firearms hundreds of years earlier. And just as in the 1770s or the 1920s, governments in similar positions today or in the future would have a difficult time maintaining military morale while trying to impose rule on a people who resist it manfully. You can acknowledge this and still deplore America’s gun violence, as I do. You can wish and even work for an American future where there are fewer weapons in untrained and unsteady American hands. And, we all should wish to maintain a law-governed and orderly society that doesn’t inspire thousands or millions of Americans to resist its government in an insurgency. But in the meantime, don’t do violence to history itself. With just the moral support of the society they are living in, and a number of rifles, a small group of men can make it impossible for tyrants to rule. Trump just joined Chuck Schumer and Diane Feinstein in coming out for no-due-process, at-will suspension by unelected federal officials of a constitutional right. 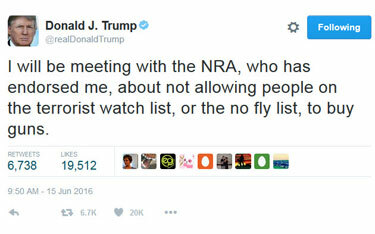 Why bother trying to pass any new Gun Control Law, when one federal agency or another can simply add anyone (or everyone) to a list of people now instantly, abracadabra! without constitutional rights? What Constitution? What Rule of Law? Trump would say. We have to be smart. This is where you wind up when you choose a pragmatist unconstrained by principles or ideas as your leader. Of course, we already had lots of professional leaders of the same kind already. They are called liberals and democrats. Donald Trump is the same thing, just appearing currently in a conservative clown suit and pretending to be a brave opponent of Political Correctness. The real Trump is completely indifferent to political philosophy, principles, theory, and ideas. The real Trump is a sociopathic narcissist driven to personal aggrandizement at any cost. He’s exactly the same kind of creature as Hillary Clinton or John Kerry, just more vulgar and with a more limited vocabulary. So he’s backtracked on Gun Control. Put him in office (if you can, which many of us doubt) and watch him backtrack on everything else, including those promised conservative Supreme Court appointments which you keep arguing justify supporting this orange-faced mountebank with a woodchuck on his head for president. Wake up, Trumpkins! In an interview with ABC News, the head of Interpol admitted that, in an era of terrorist attacks on civilian target, the notion of a governmental monopoly of force doesn’t really deliver an effective defense in time. 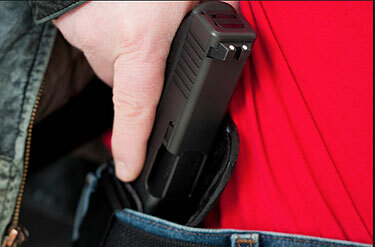 What does result in a timely response is an armed civilian population capable of self-defense. Citing a recent call for al Qaeda “brothers to strike soft targets, to do it in small groups,” Noble said law enforcement is now facing a daunting task. 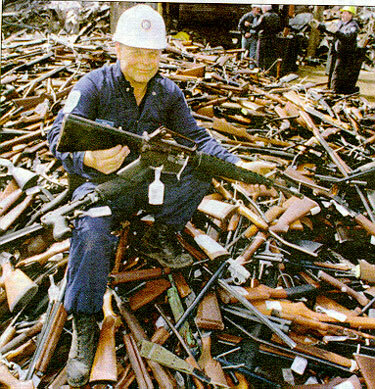 In 1996-1997, Australia confiscated and destroyed roughly one million semi-automatic and pump-action rifles and shotguns through a compulsory gun “buy back” program. Daren Jonescu notes that Hillary Clinton has already openly adopted gun confiscation Australian-style as a campaign promise and evaluates the practicalities of just how such a radical and invasive policy might be implemented. That a wide-scale confiscation program could be arranged from a purely logistical point of view is obvious, as such programs have already been successfully carried out in other nations, and far more complicated programs are administered by the U.S. federal government every day. Her reserved phraseology, then, is a bureaucratizing euphemism to mask the real problem that would make such a program difficult to “arrange” in America: resisters. Let us consider aloud a matter that progressives might prefer to reserve for private cocktail party conversations, namely what sort of “arrangements” would be required to make a national gun confiscation viable in the United States. Invading the North American mainland can be safely left in the realm of bad Hollywood films. And that’s even today, with larger ships, jet cargo aircraft, and more people. While it makes for a great strategy, in the end, it’s just a nonstarter. Why? The Germans had no forward base in the New World. If they had seized Iceland, any of the French protectorates in the Caribbean, or northern South America, then an invasion, while still a stretch, could have been conceivable. Without forward bases to deploy to and from, an invasion isn’t going to happen. Consider that the Wehrmacht was winning while America was out of the war. One of the most idiotic things Hitler did was to declare war on the United States on Dec. 11, 1941. While the Wehrmacht was about to get thrashed in the Soviet Union, it could have stage-managed that into a negotiated settlement if it had chosen to. When the U.S. entered the war, it was all in, and Germany didn’t have the cards for that kind of bet. Invading North America would have simply brought the U.S. immediately into the war, with results that would have been more disastrous than they were. And even if the Germans had landed a sizable force here, how where they going to be resupplied? 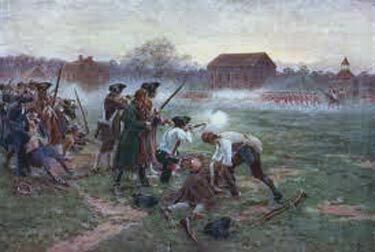 Any such force would have been trapped here until it was defeated, destroyed, or retreated. 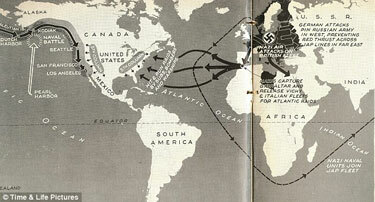 The U.S. could play at the U-boat game, and the Germans would have needed open logistics lines to keep themselves supplied. Assuming that they were somehow able to move further inland, they still would need a corridor or corridors open to the ocean for supplies and retreat. Not seeing how that could have happened. In addition, everybody had guns. One commonality among the nations conquered by Germany is that private firearms ownership was heavily restricted or simply banned. With no such restrictions here and given the fact that modern combined arms tactics were still in their infancy, it’s difficult to see how the Germans would have avoided taking heavy casualties. The Germans would have faced an armed force at least 10 times the size of their invasion force, who were also motivated to ensure that they (the Germans) would lose. Ann Althouse admires Hillary Clinton’s approach to balancing competing values and making hard choices with regard to public policies impacting Americans’ constitutionsl rights. Evidently, you balance those competing values by defining people interested in the ones you don’t like as “a minority” which you will not allow to terrorize the majority. First of all, I think as a teacher or really any parent, what’s been happening with these school shootings should cause everybody to just think hard. Back to the town hall transcript. 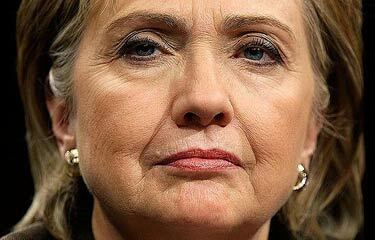 We’ve seen that Hillary has led off with her core theme: It’s hard. We make hard choices and we balance competing values all the time. And I was disappointed that the Congress did not pass universal background checks after the horrors of the shootings at Sandy Hook and now we’ve had more… in the time since. 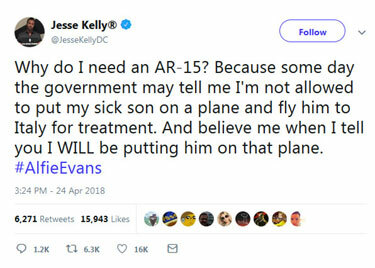 And I don’t think any parent, any person should have to fear about their child going to school or going to college because someone, for whatever reasons — psychological, emotional, political, ideological, whatever it means — could possibly enter that school property with an automatic weapon and murder innocent children, students, teachers. I’m well aware that this is a hot political subject. But I believe that we need a more thoughtful conversation. We cannot let a minority of people — and that’s what it is, it is a minority of people — hold a viewpoint that terrorizes the majority of people. … is now ready to deploy the verb “to terrorize” against those who debate and disagree with her. the Archives of Never Yet Melted in the 'Second Amendment' Category.